Music is about emotion brought to life by the training and skill to make it breathe. Il Divo is a quartet of vocalists, also called Simon Cowell’s “man band” that take operatic vocals and blur the lines into several genres including classical and pop. The Classic Christmas Album was previously released in 2005 as The Christmas Album, with the exception of one track. Now releasing with several Classic Hits albums in the new Sony Legacy collection, this album is timely with the flurry of holiday shoppers beginning to descend on shops and malls the world over. If you are not already a fan of this amazing group of singers, with one listen you will be. The band consists of Urs Buhler, Sebastian Izambard, Carlos Mann and David Miller. Three of the four are classically trained with Izambard being primarily self-taught. “O’ Holy Night” is the first song on the track list. Opening with beautiful piano strains and glowing vocals, this piece stopped me in my tracks to listen to the skilled vocalists’ rendition of this classic holiday song. The voices soar to majestic heights, each a light in the darkness calling forth heavenly music. Swirling instrumentals provide a backdrop for the men to craft a tapestry of sound introspective of the season and beyond. “When a Child is Born” sparkles to life with chimes and keyboard work. Vocals, both crisp and clear come to pass and the others join in, adding depth. As with each song on this album, the layers and different nuances of each singer provide a puzzle piece that just fits. This song, with its highs and lows and blindingly fantastic vocals made me sigh and dream of Christmas. “Adeste Fideles” is a song I remember from my childhood. Hearing this version with the tender vocals, bells and chimes made tears prickle in my eyes. Yes. “Come all ye faithful” is one I actually hum under my breath throughout the year. It brings joy on days when life is challenging and the heart needs comfort. 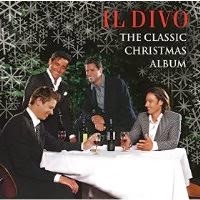 This is the first album by IL Divo I have listened to but it will not be the last. For listeners like me who are new to the group this is a powerful hook to reach out and attract new fans. It worked and here I am. These men each have different vocal skills. Baritone, tenor, classic and pop…they have it all and when you mix it all together you get magic.